While exposing a sample of silicon to extreme dynamic compression–due to the impact of a nearly 12,000 mph plastic projectile–WSU scientists documented the transformation from its common cubic diamond structure to a simple hexagonal structure. At one point, they could see both structures as the shock wave traveled through the sample in less than half a millionth of a second. 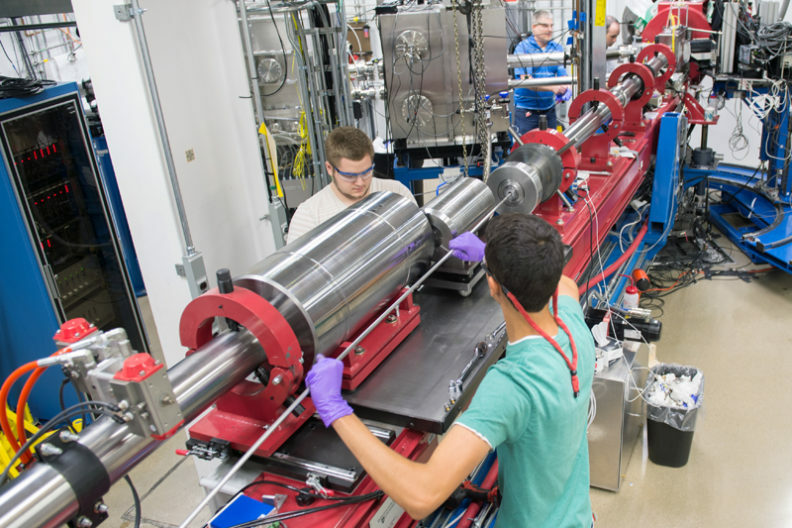 WSU led the development of this experimental capability, which allows scientists to watch atomic-level changes unfold in the composition and behavior of materials under extreme conditions. Experiments take place in a facility called the Dynamic Compression Sector (DCS). Experiments utilize tunable, high-energy X-ray pulses to make movies of materials subjected to extreme conditions, and permit scientists to view condensed matter changes at the microscopic level during a shock compression event. WSU developed the DCS at the Advanced Photon Source, a U.S. Department of Energy Office of Science user facility located near Chicago at Argonne National Laboratory. The effort was sponsored by the National Nuclear Security Administration. Contributors to development of the DCS included Argonne, Los Alamos, Lawrence Livermore, and Sandia national laboratories, the Army Research Laboratory, and academic institutions. Until now, researchers have had to rely on computer simulations to follow the atomic-level changes of a structural transformation under pressure, according to Yogendra Gupta, Regents professor and director of the WSU Institute for Shock Physics. The new method provides a way to measure physical changes and see if simulations are valid. Researchers examined silicon through DCS because they suspected that long-standing assumptions about the material would need to be re-examined. DCS will help address energy and national security challenges. It will enable scientists to understand the structure of planetary interiors and to develop lightweight materials for industrial, aerospace, and automotive applications.